Is Mickey Mouse the star of your toddler’s world? Then Mickey Mouse toddler bedding may be a wonderful way to personalize his room and make his bed something he will really want to sleep on. Mickey Mouse is undeniably cute, and his happy face all over your toddler’s sheets, pillowcase and comforter is certainly one way to brighten his sleeping quarters. Where to find your Mickey Mouse toddler bedding? No easier place to shop than the internet, and we’ve done some of your research already for you and found a few of the top-rated bedding options you may be interested in. There are lots of Mickey Mouse printed bedding set options available. They are all made to fit a toddler bed; i.e., a standard crib mattress in a special, low to the ground, bed; which means, of course, you can still begin using them in your toddler’s crib if you haven’t transitioned him out yet. 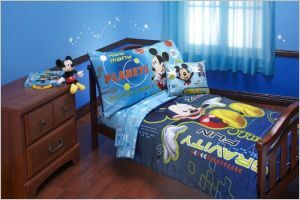 If your toddler’s room is decorated in blue and he likes space and planets, the Disney Mickey Mouse Space Adventures 4 Piece Toddler Set is a top-rated Mickey Mouse bedding set that will liven up your child’s room. Polyester microfiber means this comforter, pillowcase, top sheet and fitted sheet are super soft, and the Mickey on the comforter is enjoying his gravity-less atmosphere to the max. The comforter is light, so perfect in summertime; if your thermostat is low in wintertime you may want to add extra layers. 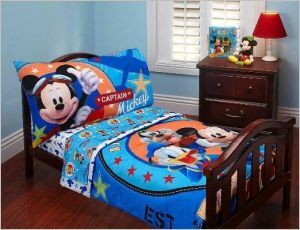 If Space Adventures is not your toddler’s thing or you’d prefer a brighter colored set the Disney Mickey Mouse 4 pc Toddler Microfiber Reversible Bedding Set with Clubhouse Captain Mickey may be a good option. This is also all microfiber, so very soft sheets, pillowcase, and bedding; and the colors are vibrant and wash well. The comforter and pillowcase are predominantly a bright blue, the fitted sheet white, with dark blue mickey heads, stars, and planes. Do you have the toddler bed ready to use these new sheets on, or are you shopping for that to? 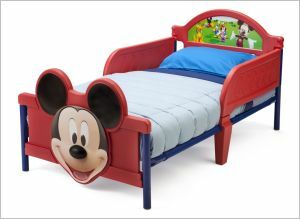 If you are still in the market, you can buy a special Mickey Mouse toddler bed with an enormous, 3D Mickey head at the footboard to go with the Mickey Mouse toddler bedding you just bought. The Delta Children's Products Mickey Mouse 3D Toddler Bed takes a crib size mattress and fits your Mickey Mouse bedding set perfectly, but it allows easy access for your little guy or girl with a low-to-the-ground, safe design. There are also two bed rails, extending about half the length of the bed. The bed comes in pieces, but is easy to assembly; it is made of steel and sturdy plastic. It is lightweight, so if you decide on a different placement after setting it up you won’t have any trouble moving it. It doesn’t change much to spiff up a little person’s room, and it can make a big difference between a child who is recalcitrant about going to bed or who races for his sleeping quarters the moment it’s halfway time. So have fun decorating!